Hardware requirements for a good DAW laptop really depend on the type of audio you will be doing, whether its voice recording/editing, music recording/editing, a combination of both, or editing the soundtrack for video. It also depends on whether or not you will be adding a lot of plug-ins which can rapidly eat in to your processor load. This post at producerspot.com has a good list of questions to ask yourself. Adobe also has a list of specifications. Audio editing places a great demand on the processor particularly if you’re editing and creating multi-track pieces. Adding any number of VST plug-ins can slow down your machine considerably. The processor’s business is to handle all the tasks and instructions from the software and the multiple requirements of audio editing can place quite the strain on its business. For this reason you want a processor that is able to move quickly from thread to thread and have multiple cores to share the work. For this type of work, you’ll want a minimum of an Intel i5 Quad Core (coded as HQ in Intel’s numbering system). It’s best to have at least 3 Ghz of speed if you can manage it. Next to the processor, memory or RAM is absolutely essential for a good running environment. The processor loads information into RAM for quick access, but if the information doesn’t fit, then it needs to go to storage which usually takes longer. Adobe recommends at least 8 GB of RAM and for some tasks, you may want as much as 16 GB, if not more. Some audio recording professionals actually see 24 GB as a standard. In addition to providing back up to memory for access to frequently used data, storage also provides space for all your files. One of the drawbacks to the old HDD drive is that it has too many moving parts which causes it to break down more frequently as well as being noisier than the newer, faster, and quieter SSD drive. The HDD does hold more storage, but isn’t as efficient as the SSD. This forum at Adobe speaks mostly to the feedback on sound cards, but also mentions how, in general, the noise of a PC can get in the way of the audio processing. Having an SSD can cut down on the noise considerably as well as reduce the need for cooling. Fans also can interfere with the audio process. One thing about Adobe Audition is the number of windows you’ll have open at one time. For that reason having a decent amount of screen space is essential. In addition, if you’ll be working with video, you’ll want to have good resolution. Adobe recommends a display 1920 x 1080 or larger. Now its possible you could use an outside monitor for much of your work, but if that’s not an option, then make sure your display capacity is sufficient. I put this under minor requirements, because having a dedicated graphics card may not be as important if all you are doing is audio editing; but if you plan to integrate with other Creative Cloud applications, you likely want one that meets the OpenGL 2.0 standard. This can also make it easier to keep track of the different windows you need opened while working. Any of the Nvidia cards, 960 or above, would suit the requirements well. There are any number of additional requirements you can consider when putting together an audio studio and it really comes down to your budget, the type of audio work you want to do and what you want in a studio set up. While not absolutely essential, I would recommend having at least one USB 3.1 port which you can use to add a hub and any other peripherals you might want. A backlit keyboard can make things easier to see and is a nice addition to your set up. Whether or not you have a touch screen really depends on your own preference. This video, How to Build a Home Studio 2017, focuses mostly on recording vocals. If you’re wanting a full home studio, but are limited in your budget, this video, How To Build a Home Studio For Under $350, should give you some good ideas. If you’re wanting to learn more about the hardware requirements for digital recording, this article gives more detailed information. Although Steinberg creates a different DAW (Digital Audio Workstation) than Adobe, the company created a product on which most current DAWs are based. I mention this company only because they have an excellent guide to the hardware requirements you might need to run Adobe Audition. The HP is a good choice for the price. It’s hard to find a suitable laptop for much less than this amount. On the plus side it has a good processor with multiple cores great for hyper-threading. The i7-6700HQ runs a little slow at 2.6 Ghz, but with its 6M cache, speed can be increased to 3.5 Ghz. Having a Quad Core CPU and 16 GB of RAM for this price is fairly rare. Depending on the type of work you plan to do, you can always spend a bit more by adding the 240 GB SSD or even going to the 512 GB SSD. You might find the weight of the machine a drawback if you plan to do a lot of audio mixing on the fly, but the battery should hold for up to six hours. If you like the touchscreen interface, this would be a good choice. A good DAW laptop can easily take you above the $1000 range and this laptop from Alienware is no exception. The Intel Core processor on this model reaches speeds of 3.5 Ghz with Turbo Boost. For working with video, the Nvidia graphics card on this model should provide a good picture. You only get minimal RAM, but you have the option of adding up to 32 GB if needed. It has a backlit keyboard and a USB 3.1C port which is great for adding peripherals. The primary drawback is the small storage space, but this can be remedied with an external drive. The hardware on this model meets all the specifications you would want for audio recording. While not being the lightest laptop going, it’s still fairly portable for audio mixing in the field, and the battery should last for awhile. You are limited to 500 GB of storage with no option to install more, but the USB 3.1c port will allow for externals. When you combine video with your audio work, you’ll be pleased with the 4K resolution on the touch screen display. With its 7th Generation Quad Core i7 processor, this laptop reaches speeds up to 3.8 Ghz which will allow you to do live voice editing without any performance losses with low delay. For working with the video side of things, the graphics card is ideal and you’ll appreciate the 4K resolution of the touchscreen display. While not absolutely necessary, having a full-sized backlit keyboard is a bonus. Its biggest drawback is it is limited with only an HDMI port, so that might restrict your use of peripherals. You do have some options with varying costs in size of RAM and your choice of storage. While it does offer 1 TB HDD, for the noise factor you might want to stick with the SSD. Now that you have chosen a laptop, check out the video tutorials offered at Adobe. The list at Premium Beat shows the eight videos to watch. 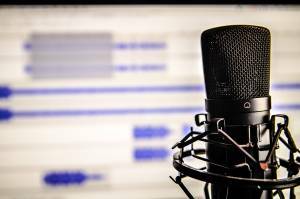 Finally, as you get into the process of audio recording, this Home Recording forum can answer questions you might have about the audio recording process on your new laptop.